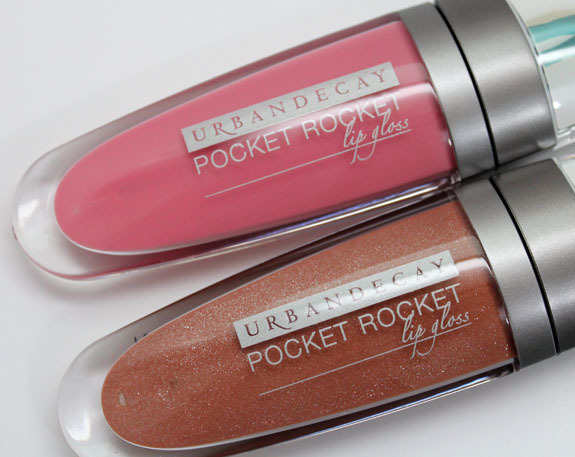 Urban Decay has two new shades of their Pocket Rocket Lip Gloss out this spring. As you can see Rashad is a pretty sheer wash of pink. Nice and shiny though and not too sticky. Dustin is a very warm almost caramel sugar colored shade with yellow shimmer. Really pretty color. But there is something I cannot get past with these glosses. The scent and taste. It’s a very strong brown sugar smell and taste and I really dislike it. In general I’m not a fan of anything “fall” scented like sugar or cinnamon or spices, so this just turned me off. Nice colors, and shiny non-sticky gloss, but if you don’t like the smell or taste, they may not be the best fit for you. 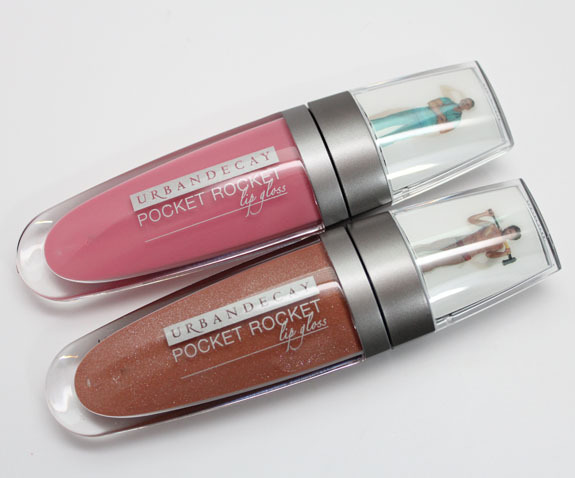 Have you tried any of their Pocket Rocket’s before? 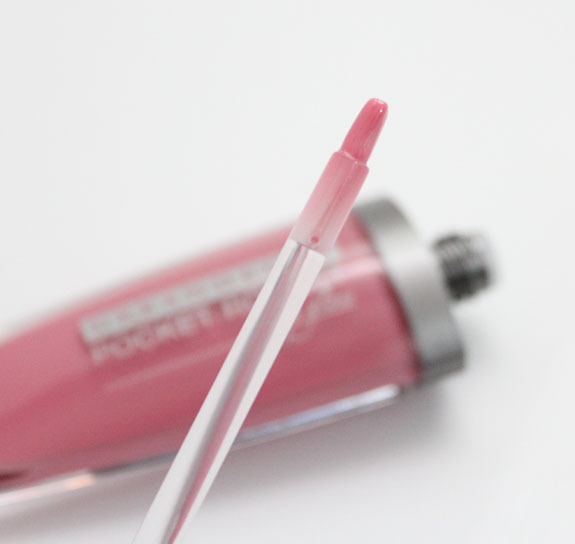 I have tried a UD gloss and I actually really like the scent! Can’t comment on the taste though. I never lick my lips even if I’m not wearing any lip product (heard a long time ago it actually dries your lips out, so I quit doing it ever since). These look like fun! Who doesn’t want to see some muscles when they pull their lipglosses out of their bags lol I like how Dustin looks on you, though it’s probably a shade that will make me look weird. Sunny´s last post…Review: L’Occitane Shea Butter Hand Cream + L’Occitane Belgian Facebook Page Giveaway! I don’t lick my lips either (it does dry them out) but this is so strong that just by having it on your lips you can taste it also. Wish it was unscented! It is very true what you said about licking your lips. It does dry them out! But I can’t help it and automatically lick them when something is on them, like balm or gloss. That’s why I like lightweight products you can’t feel or can barely feel. 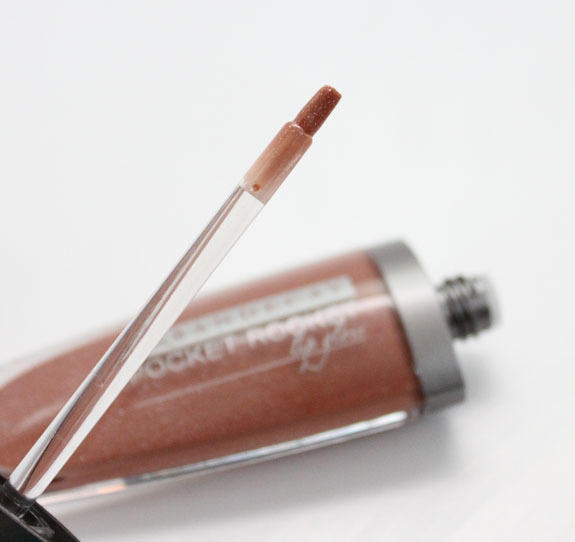 I havent tried any of the pocket rockets before but I always notice them…how could you not notice lil stripping me in lipgloss tubes 😉 I’ve never been too interested in these for the actual glosses though. Probably since I have so many already that I dont even use. Plus….living in a somewhat windy area…gloss is a major no no if I dont want to have my hair plastered to my face everytime I go outside. men* hehe…not me…that would be awkward. Haha!! 🙂 Yeah I hear you on the wind thing. I work near the SFO airport and it’s SUPER windy out here. No fun. I don’t know why I can’t get behind what I classify as “fall scents”. I have never liked them in candles, makeup, tea, perfume, etc. Vanilla is about the only one I can handle! I have so many glosses that I haven’t really wanted these. The shades always look nice. The taste sounds good to me. Unfortunately I’m a lip licker. Not as bad as I used to be. Dustin is really a pretty shade. Thank goodness someone else dislikes the smell! My friends think I’m crazy! The only reason I own one is because it was on sale for $5 and I have an obsession with deep plum and purple lip products. 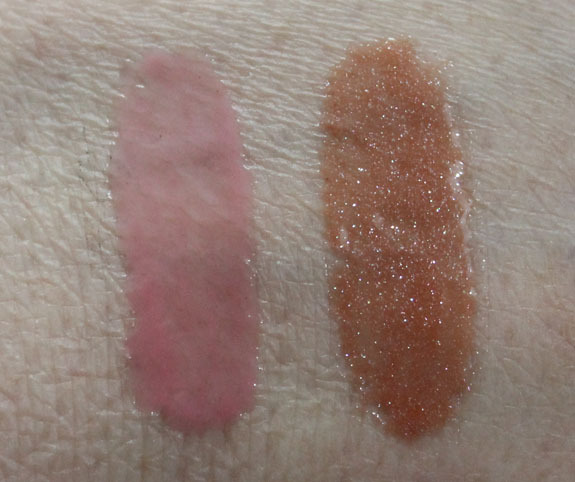 I have one of the lipglosses from a UD set I bought and do you know what the glosses smell and taste like— A popcorn flavored jelly bean! It’s very strong! I have one of these in “Jesse” (lol) and it doesn’t smell so much like brown sugar as…vitamins (but sweet). It’s so weird. I’ve heard other people say they smell like puppy kibble (?!). I purchased it during an HauteLook sale, so maybe it was old stock, I don’t know. It’s too bad, because I love how non-sticky it is! Alicia´s last post…Makeup Zombie’s Epic 1000 Follower Giveaway! If glosses have a taste or smell I can’t stop licking my lips. Horrible habit. I thought I was the only one who didn’t like fall scents, well, no, I knew there had to be at least a couple others in a world of billions, but you know. lol Everyone goes nuts when BB&B stocks pumpkin this, cinnamon that, etc and I just want to avoid it. ellemck1´s last post…Good Luck Ravens!